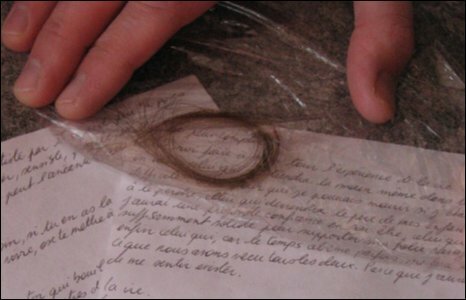 A French love letter and a lock of hair have been discovered in a bottle washed up on a Cornish beach. Martin Leslie, who is sector manager for the coastguard, discovered the note at Praa Sands when he was clearing debris from the shore in west Cornwall. The bottle, which was sealed with candle wax, was dated 25 September. It was written in French by an unnamed woman who poured out her feelings and understandings for her lover who had to return to his wife. The letter included references to love, death and heartache. It covered three pages of A4-sized paper and was accompanied by the lock of brown hair. It opened with: "I'm not, and nor are you. When I am dead and that I will have lost the spark of my 20s, and I know that happens, at this point I will come back to you and you in turn will give me back your extraordinary passion for living. I am not dead. Yet." Mr Leslie, who does not speak French, tried to translate the letter and was concerned about its content. He said: "I assumed that it was a suicidal note that we came across. I contacted Falmouth coastguard who sent a fax of it to our counterparts in France. "It was found to be a love letter. She (the writer) explained they had a good time together. She loves him but understands he has to return to his wife, and hopes she will find a man like him to live a beautiful life." The unnamed woman recalls the time she and her lover spent together, alluding to the affair. "These magic moments are pure secret. The secret of life and pleasure without limits. In twenty years, it will still be here, the previous moments of happiness, when life will get dreary, we will be able to tap into these memories to remember what it is to live again." Mr Leslie said he was planning to keep hold of the letter, which was left unsigned, with no contact address.